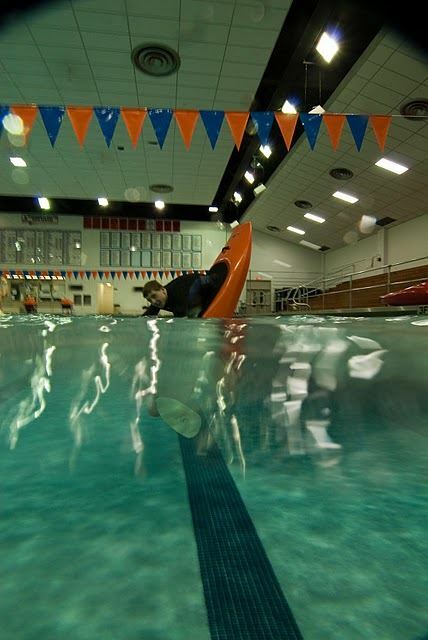 In our Freestyle Fundamentals classes, we will focus on the skills that will help kayakers of all levels learn to move their boats in every direction including the use of edges, trim and balance for play boating. Participants will be introduced to techniques that will lead to cartwheels, double pumps, bow and stern stalls. These clinics are really fun and will not only work on specific freestyle skills, but will give students a pathway to improve the movements that make EVERY freestyle trick happen. This way they can build the strength and skills necessary to learn any trick much more quickly. This will also be a great work-out--you will be sore after! These drills typically become part of daily warm-up and practice routines, even for the best kayakers in the world. Prerequisites: Ability to comfortably maneuver your kayak at an intermediate (Level B) level. Participants must have a reliable roll and a properly outfitted play boat. Cost: $50 course fee plus $10 pool admission for each pool session. Playboating Clinic A - February 24th 1-3 PM. Registration closed. Playboating Clinic B - February 24th 3-5 PM. Registration closed. Watch the Spray newsletter for any summer clinics. And as always check back in December/January for next year's clinics!